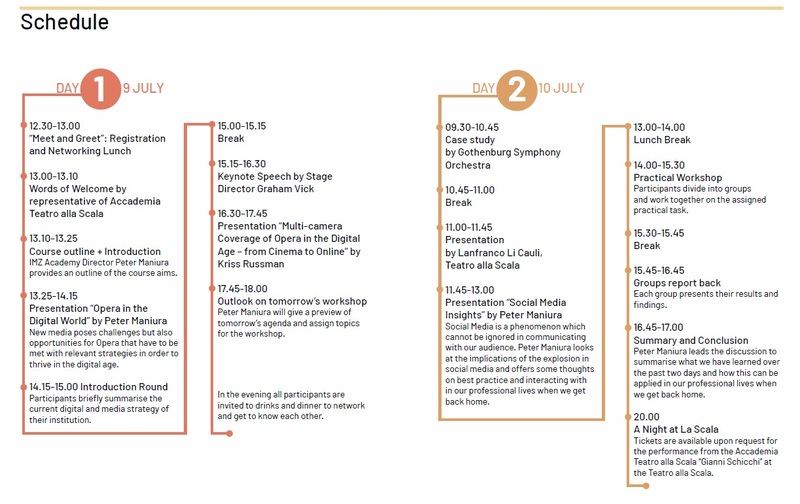 IMZ Academy Re-Imagining Opera for the Digital Age looks at the opportunities and challenges offered by digital, online and social media for opera houses – the cradle of the art form. This course is designed to help opera houses identify and establish relevant strategies to promote and position themselves in the digital world. On the one hand, we are looking into creative ways of communicating with their audience, on the other hand, we are examining possibilities and technologies in performance capture and streaming in order to reach and engage new audiences in an innovative manner. The programme will be led by IMZ Academy Director Peter Maniura, who has more than thirty years of experience of working with renowned opera houses internationally, on a wide range of major events, live broadcasts, live streams and digital initiatives during his time at BBC Arts and BBC Music. In addition, expert speakers from the performing arts and media world will share their insights in a highly practical manner and cover artistic, as well as technical and financial challenges and examine best practice in performance capture, streaming, editorial curation and audience impact. Speakers from renowned organisations share their professional insights and know-how. Practice-driven approach to learning with real-life examples and concrete challenges. Networking opportunities with international participants from across the industry, meeting potential co-operation partners within the IMZ and the Accademia Teatro alla Scala network. Representatives of Digital and Media Development Departments of Opera Houses and Theatres. - To examine best practice in performance capture and the latest technologies in capture and streaming. July 10, from 9.30 am to 5 pm. If the invoice recipient is a taxable person/company that is EU VAT registered, the reverse charge system according to article 19/1 UstG applies. If the person/company is located in Austria or in a Non-EU-Country, 10% VAT will be added. To register, please visit www.imzacademy.com! The fee covers the participation of the IMZ Academy, teaching material and refreshments during the day and has to be paid in advance. The fee does not include travel or lodging expenses. Please take care of travel arrangements and lodging yourself. If you would like to get advice on hotel accommodation, please contact the IMZ office at imzacademy@imz.at. In case of a cancellation before 1 May 2019 50% of the registration fee will be refunded. In case of a cancellation after 1 May 2019 the registration fee will not be refunded.